So Dave Blachura won't be competing in the last chance qualifier for the Calymore Challenge tomorrow. Dave sprained his ankle pretty bad on Sunday and it is still in rough shape. 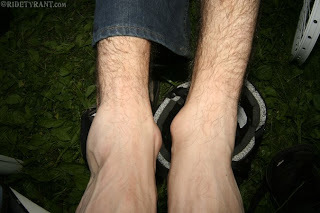 Fearing worse injuries and more time off the bike, Dave is using his head and babying the ankle till its healed up. Rumor has it Dave will be gimping around The Lot getting the place dialed while he's recouping. The new elevated bridge/drop off should be going up tonight!!! I got a large and a small stencil cut today to tag up the ramps, bridges, etc. at The Lot. Sweet!